Set to graduate this month, Kogod School of Business student Cody Guyer is ready for the next step. 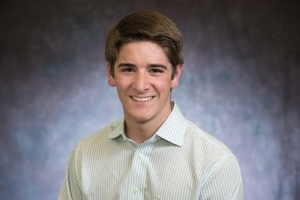 Guyer, BSF '16, is a senior majoring in Finance and minoring in Economics. He spent some time recently reflecting on his time Kogod, as he prepares for what comes next. Guyer urges students to be active, enthusiastic and humble with everything they come across in life. "You have to keep trying things out, keeping your doors open to new opportunities until you find yourself putting in extra effort and showing more passion for something other than what is expected from you." By going outside of his comfort zone, Guyer believes that he has learned more about himself and expanded his horizons. During his time here at AU, Guyer was very active. He participated in several on campus organizations, including the 1955 Club, the student-managed Investment Fund of AU, as well as a member of the Lambda Chi Alpha Fraternity. Through the help of his friends and business connections, Guyer secured three internships, four part-time jobs and a full-time career after graduation. His interned for the senior vice president of CNH Industrial, a construction and agricultural equipment company, Oppenheimer and Co., and HSBC Bank. Guyer believes that these opportunities came about because of his network. "Either classmates or faculty that I grew close with saw me as a hard worker with a dedicated personality, and were willing enough to recommend me to job and internship openings all over campus and DC." After graduation, Guyer will begin working as a supply chain analyst for Cargill Inc., in Shippensburg, Pennsylvania. He hopes to gain a greater knowledge and understanding of his career by applying the skills and knowledge he learned in school, while also creating a greater value for himself in learning new career skills. Like others in his graduating class, Guyer is hopeful for the future. Applying the knowledge he gained from his courses, professors and friends, Guyer believes that his future is bright, while also feeling a sense of accomplishment by completing his undergraduate degree. As Guyer concludes, "I would say that I achieved my goals plus some."